Maurizio Sarri plans on giving Chelsea’s two best teenagers, Callum Hudson-Odoi and Ethan Ampadu, the chance to integrate into the first team in the second half of their season, rather than go on a spending spree to plug gaps in the squad. Hudson-Odoi’s long-term future remains in doubt as he refuses to renew his Blues contract with just 18 months remaining, leaving Bayern Munich hopeful that they can secure a £35 million deal for the 18-year-old in January . 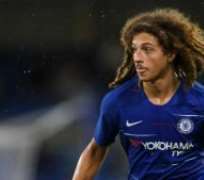 Ampadu, who is also 18, signed a five-year contract in October and he has been told by Sarri that he will replace the outgoing Gary Cahill as the club’s fourth-choice centre-back. Sarri is also hoping to replace the players he has lost in January, as Chelsea negotiate for both Cagliari’s Nicolo Barella and Zenit St Petersburg’s Leandro Paredes to come in for the now departed Cesc Fabregas. He is also hoping to get AC Milan’s Gonzalo Higuain in as a replacement for Alvaro Morata, who has interest from Atletico Madrid and Sevilla, but he adds that Hudson-Odoi and Ampadu can also provide a boost to Chelsea’s end-of-season chances. “As I said before, the club knows my opinion, and in my opinion we need two players,” Sarri told reporters at Stamford Bridge after his side’s 2-1 win over Newcastle United . “If you ask me something else then I don't know what to answer because I am not in charge of the market. The bench is not very short. It has been left short in only one position at the moment because I think that Hudson-Odoi is improving. Chelsea’s ultimate aim in the Premier League this season is to finish in the top four, as Willian and Pedro’s goals helped edge out Newcastle at Stamford Bridge. Jorginho struggled in that match and Sarri wanted to haul him off, but Fabregas’ departure left him short of a player that can play in what some term as the ‘regista’ role. Sarri admitted that his £57m signing from Napoli wasn’t good enough and spoke about potentially using Ampadu in that role. “Have you seen the match?” Sarri continued when asked about Jorginho. “After 20 minutes, he lost a lot of balls. It is unusual I think. So I think that he was in trouble, maybe he was tired, I don't know. “In the future maybe [we can try Ampadu there], but we have to work. Playing as a central midfielder in our team is not easy, we need to try and try and try in training with him. Chelsea used Eden Hazard as a false 9 again against the Magpies and he bagged his 10th Premier League assist of the season which saw Willian take his chance to make it 2-1 and win the game. Hazard has previously said that he prefers to play on the left wing, but he is being forced into a central role as doubts remain over Morata and with Olivier Giroud perhaps not having the ideal attributes for Sarri’s style of play. Sarri admits that Hazard didn’t enjoy the role in the first half, but explains why he is increasingly making this position his primary one in west London. “Not in the first half, but in the second half my feeling was that he enjoyed it,” Sarri said of Hazard’s role down the middle. “I wanted to see the solution with three small players, I think in this moment it is a very good solution because we are not less dangerous in the offensive phase and then in the defensive phase we are more balanced. “In the last six matches, we conceded only three goals and one was from a penalty. I think that at the moment, in the defensive phase, we are doing very well. One of the reasons I think, in my opinion, is that Eden is playing in that position. “For his characteristics, of course, he goes in the direction of the ball. We need to learn to attack spaces, or attack the box with the other players. It was better today with the other wingers in attacking spaces more than the box. We scored after 10 minutes by attacking spaces behind the lines with Pedro.